Best Strollers for Toddlers for 2019 - Here's our Top 10! ​Check out Amazon's Top ​​Rated Strollers for Toddlers! Hey Hey! Jeff here with SnugBaby.net. I know you’re here because you’re looking for the absolute BEST Stroller for your Toddler. Well, I think I can help! I’m a dad of one boy (and a new baby girl, as of 9/19/2018). I am also a very picky buyer. I went into full nerd mode while researching and buying a stroller for my oldest. I looked at dozens and dozens of models, compared features, prices, customer feedback, weight capacity, dimensions and so on. I recorded all info into an excel sheet. I have reviewed several models below. I am sure that you’ll find the one that best suits your needs, budget and lifestyle. ​Still Not Sure What to Get? This stroller has an aluminum frame. It weights a very manageable 18.8 pounds and can carry a baby weighing 40 pounds or less. Fun Fact: Airplanes are made up of Aluminum because the metal is durable yet very light. If you’re looking for a stroller that is well-designed, reliable, feature-loaded as well as light, nothing comes close to the Liteway by Chicco. 1) This model was specially manufactured for short outings and getaways. It is travel friendly owing to its compact dimensions and one-hand 3D fold mechanism. The stroller also has an automatic storage latch and a smart carry handle. 2) The Liteway’s seating features a good amount of padding and also an adjustable footrest for extra support and comfort. 3) The backrest has 4 recline positions. It can be adjusted with just one hand – The adjustable footrest and backseat make this stroller suitable for growing children. 4) The removable, adjustable canopy protects the occupant from the Sun. Peek-a-boo window enables the parent to keep a close watch on the child. 5) The Chicco Liteway has a smart storage basket with an automatic latch and a cup-holder for the caregiver. 6) The handles are foam padded for better grip. The stroller has optional swivel front wheels and rear-wheel suspension for a smooth ride over various surfaces. Convenient toe-tap brake keeps the Liteway in place over inclines. 7) Excellent build quality and a cool, contemporary design. 5 point harness with padded shoulder pads help to keep the child secure. The Liteway is durable, comfortable and easy-to-use. All adjust and folding mechanisms work flawlessly. Yes, it’s a bit expensive but totally worth the price. Chicco is a well-established brand and if their customer happens to experience niggles with their product, they’re usually fixed quickly. Everything about this stroller is well thought-out. For example: Many lightweight strollers have very low handles and hence, the parent needs to bend forward while pushing/steering. This is not the case with the Liteway, thanks to good ergonomics. A cute looking (according to my wife), well designed model with lots of storage space. The Britax B-Free has three wheels (much like a jogging stroller) – one upfront and two at the rear. However, they are rubberized wheels so you never have to worry about flats. The stroller can tackle various types of terrain and so you’re ‘Free’ to go on wherever you want. 1) The stroller is fairly light at just 22 pounds. It can accept a maximum weight of up to 65 pounds. 2) The Britax B-Free has seven storage pockets plus an extra large storage basket with front access. 3) Parents can maneuver the stroller very easily. The three wheel design ensures that it turns on a dime. 4) The stroller is roomy without being overly bulky. 5) The B-Free folds swiftly and with just one hand. It has an automatic lock and stands on its own when folded. 6) A huge canopy with SPF keeps toddler shielded from the Sun. It has magnetic closure instead of the noisy and ubiquitous Velcro straps. 7) Just like babies, parents too come in different sizes. Britax has added an adjustable handlebar to maintain compatibility with people of varying heights. The caregiver can select a handlebar height between 38 and 44 inches. 8) The spacious seat is equipped with a 5-point safety harness and can be reclined using the one-hand strap recline feature. This makes it usable for newborns and for napping. 9) The footrest is fully adjustable. This helps to achieve a comfortable, ergonomic posture for virtually any toddler. 10) The stroller is extremely well built and stable. It remains evenly balanced at all times. You’ll have to try hard to make it flip over. Some strollers can do a wheelie if you as much as hang a bag over the handlebar! Honestly, not many! It lacks a cup holder and child tray but those can always be purchased separately. The Britax B-Free can be converted into a travel system stroller by pairing it with an infant car seat, such as the Britax B-Safe 35 or B-Safe 35 Elite. Click-n-go receivers are included; there’s no need to buy anything separately. This three-wheeler looks much like a jogging stroller. Thanks to its rubberized wheels, it can tackle various surfaces such as grass, country roads, pavements etc. Even though not designed for jogging, this a highly capable everyday stroller – it turns freely and the ride is plush. 1) The 7.5-inch front and 10 inch rear wheels do not contain air-filled tubes. They require next to no maintenance and never go flat. 2) The stroller has an all-wheel suspension. This enables it to absorb shocks and glide over most bumps and irregularities with fluency. 3) The seat features a 5-point safety harness and reclines almost fully flat – your toddler can nap in it after a tiring day of fun and adventure. Extra-large canopies with SPF protect the occupant from the elements. The footrest is also adjustable. 4) The stroller weighs just 22 pounds and holds up to 65 pounds. It has 7 storage pockets and a large storage basket that can be accessed from the front. There’s ample room for basic supplies and toys. 5) The handle is adjustable. People of all heights can push the stroller while maintaining good posture. Kudos to Britax as this feature is usually seen only in high priced models. 6) The B-Free has a true one-hand standing fold. It can be folded within a blink of an eye. 7) The stroller comes with click-and-go receivers that allow it accept infant car seats. Britax recommends using the B-Safe 35 or Elite model. Although the stroller is not at all short on storage room, accessories like child trays and cup holder are optional extras. The Britax B-Free is impeccably built and has no major flaws. Hence, despite being a relatively new model, it still features on our list of the best stroller for toddler. Manufactured by the 77 year old Jeep brand, the Scout stroller combines quality and affordability into a practical, feature loaded package. The USP of the Scout is it’s low price. However, that does not mean that the product is poorly made. In fact, the stroller is JPMA certified and meets or exceeds all ASTM and CPSC standards. 1) The seat has a five-point safety harness. The shoulder straps have soft padding – they restrain the child without causing discomfort. The seat reclines to multiple positions so that the curious child can look outside and go to sleep when its siesta time. 2) The stylish canopy is not just a formality. It is extendable and comes with a visor to block out the Sun. There’s also a peek-a-boo window so that the caregiver can keep a watch on the toddler. 3) Bits of the stroller are covered with reflective material to make it stand out after dark. 4) The stroller has a lightweight steel frame. It weighs about 16 pounds and can hold up to 45 pounds. 5) Equipped with 7 inch rear and 6 inch front tires, the stroller is always eager to scout out and about. The rear wheels can be locked using a step brake. 6) Very easy to assemble. Quick and convenient umbrella stroll with automatic locking latch. 7) The two handles rotate to 8 different positions. The height is more or less fixed at 43 inches. Even taller parents can push without hunching forward. 8) There are several storage options – a large bin under the seat, a canopy bag, detachable side pockets and also a parent cup holder. The J is for Jeep Brand Scout can be converted into a travel system by purchasing the Jeep car adapter, which makes it compatible with Chicco Keyfit 30 and Graco SnugRide 30, 35 and 40 car seat models. This is now a really compelling proposition! Available in 4 unique colors, this stroller has a lightweight aluminum frame that lends strength without adding weight. It also has a unique wheel configuration that enables it to do justice to the B-Agile moniker. The two front wheels have a swivel lock – they’re set very close to each other and function as one single unit. This enhances maneuverability without compromising stability. 1) Looks really good. The design is minimalist yet elegant. The stroller weight is 18 pounds and the payload is 55 pounds. 2) The stroller has very good cornering ability. It steers easily on crowded streets and in busy shopping centers. 3) The stroller folds momentarily with just one hand. 4) The all-wheel suspension set-up ensures an exemplary ride for the occupant. The build quality too, is amazing. The stroller feels very modern and pushes with next to no effort. 5) The linked parking brake keeps the stroller locked even on gradients. 6) The Click-n-Go system is compatible with any Britax infant car seat. Hence, the B-Agile can be used right from birth. There’s no need to keep changing strollers as the baby grows up. Note: Receivers are part of the package. You don’t need to purchase them separately. 7) The seat offers good support and reclines a fair bit, although not all the way. Padded 5-point safety harness keeps baby safe. 8) The adjustable canopy is really large. It does an excellent job of blocking the Sun. wind, dust etc. 9) There’s a large storage bin and a zippered pocket to hold all baby supplies. 10) This is a full sized stroller but it weighs almost half that of other products in its class. 1) The handle height is not adjustable. However, it is quite high at 40.5 inches. Should not be a problem unless the caregiver is very tall. 2) No cup holder or parent tray. Accessories need to be bought separately. The B-Agile is one of Britax’s most successful model and among the best selling stroller for toddlers in the country. This model has fours wheels but in a three wheel set up. The swivel-locking front wheels pivot around a single hinge and effectively work as one. This enables the stroller to turn quickly when needed. The wheels lock for strolling in a straight line. 1) The stroller is made to take on any urban challenge. It is roomy yet compact and nimble at the same time. 2) The 8 inch EVA tires offer superior traction over a variety of surfaces – from malls to sidewalks. 3) The over-sized UB 50+ canopy is rectractable and fully adjustable for occupants of different heights. It keeps both rain and the Sun out and has two peek-a-boo windows. 4) The seat has a carrying capacity of 50 pounds. It reclines to multiples positions. 5) The stroller folds almost instantly with just one hand. This is possible thanks to Baby Jogger’s patented one-hand folding technology. 6) Despite being a full-fledged stroller, the City Mini is not heavy at all. It weighs a little under 18 pounds. 7) The stroller can be upgraded into a travel system by procuring the relevant car seat adapter. This makes it compatible with multiple mainstream infant car brands such as Chicco and Britax. A bassinet can also be purchased separately if required. 8) Plenty of storage spaces – a parent organizer and a big storage basket. 1) Handlebar does not adjust. It is fixed. However, it is 41.5 inches high and so most people won’t really feel the need to adjust it. 2) Seating position is not very upright. 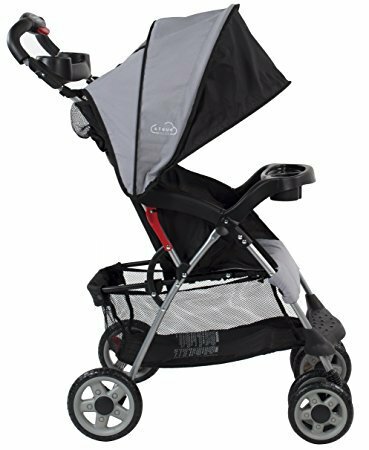 Overall, The Baby Jogger 2016 City Mini is one of America’s top selling strollers for toddlers. It is classy, versatile and practical. Looks polished too! Rounding up #7 on our list is the Summer Infant 3d Lite Convenience Stroller. This badboy weights just 15.87 pounds. It features an airlight aluminum frame – it’s light enough to be pushed and carried with ease and strong enough to last a long time. 1) Can accommodate up to 50 pounds. This is the right choice for growing kids. 3) The canopy provides shade against Sunlight. It is adjustable, removable and comes with a large pop-out sun visor. 4) The 6-inch wheels provide a decent ride. The anti-shock with front wheels prevent sudden jerks – optional swivel feature makes steering easy. Rear wheels are lockable. 5) The 3D Lite has plenty of storage area. There’s a large basket that can be accessed from the rear as well as a hook-n-loop pocket for smaller stuff like keys, phone etc. The caregiver also gets a cup-holder. 6) The stroller has a compact, 3-step fold with automatic lock and a carry strap for convenience on the go! 7) Very efficient after sales support system. Customer service is very responsive. Quality-related issues are very rare and the company sorts them out in a jiffy. 1) The 3D Lite does not stand up on its own. 2) Ships only within the USA. You cannot buy this stroller if you’re located outside the USA. 3) Not ideal for taller children. The Summer Infant 3D Lite is one of the best-selling lightweight strollers in the country and it’s easy to see why. It’s a high quality unit with loads of features and a sensible price tag. It keeps both the child and the parent happy! At just 10 pounds, the North Star is the definition of a ‘lightweight stroller‘. 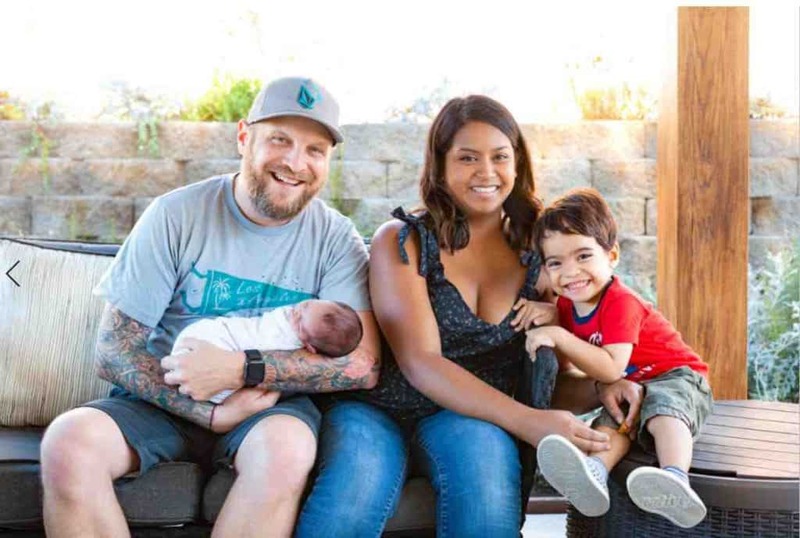 It’s a godsend for families who already have a primary stroller and are looking for something cheap and easy to use for short outings and travel. 1) The stroller holds up to 40 pounds. The seating offers good calf support and the footrest makes the ride pleasant and relaxing. On very hot days, parents can roll up the back-padding to expose a mesh layer. The folded-up padding acts a comfy headrest while the mesh improves air-circulation and keeps the child cool. 2) Unlike most ultralight strollers with very low handles, The North Star stands tall at 42 inches. This, along with the front swivel wheels and extra long foam handles make it easy to maneuver. 3) 5 1/2 inch front and back wheels with front suspension account for a smoother ride. Most strollers in this weight and price bracket have no suspension at all! 4) The extendable canopy works reasonably well and blocks out most of the Sun. Three point harness keeps the child secure. 5) Large storage area and compact umbrella folding mechanism add to the desirability factor of this stroller. 6) Limited 90-day manufacturer warranty, JPMA certified. Meets or exceeds all CPSC and ASTM safety regulations. 1) The seat does not recline. Your child cannot go to sleep in the upright position. 2) The safety harness does not include shoulder straps. 3) Available only in the 48 contiguous states of USA. Over all it’s a great stroller! The unique selling point of this stroller is that it weighs just 10 pounds while still offering a handful of features. It’s not perfect but it’s affordable, practical and fairly durable. This stroller offers loads of features at a bargain price. Let’s see if it’s any good. 1) Seat has a 5 point safety harness with adjustable backrest. It reclines to almost 180 degrees and comes with a sleeping cushion. 2) The Oxford Sun canopy shields baby from ultraviolet rays. It too, is fully adjustable and has a peek-a-boo window. 3) The swivel-lock front wheels have 360 degree rotation. Costzon claims that the stroller can be used for jogging. (I suggest taking this information with a pinch of salt.) The stroller does not feature bicycle style air-filled wheels – just regular wheels. I think the wheels are OK for brisk strolling on dedicated tracks but I’d think twice about jogging on country trails. The rear wheels have step-on brakes for locking. 4) There’s a very usable parent organizer tray with cup holders and a removable child tray. Many luxury strollers offer these only as optional extras. So good job Costzon. 5) A good amount of storage space. 6) Metal frame construction. Folds easily. 1) The stroller is light. It weighs 16 pounds. However, the carrying capacity is a little low at just 33 pounds. 2) Overall build quality is not that great. 3) Handle does not adjust. Height is 39 inches. 4) The stroller is small. It is not compatible with car seats. Honestly, My assessment is that Costzon has tried to offer decent value for money. However, the fit and finish needs to be better. Neither is the stroller light and compact enough to be an umbrella stroller, nor is it sturdy enough to be a jogging stroller. Still, many buyers choose it for the low price, maneuverability and features. 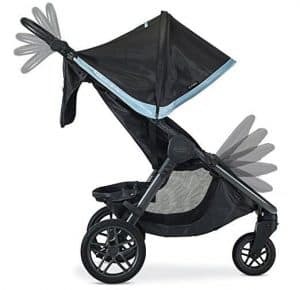 I was wondering why this stroller is called the Cloud until I realized that just like a real cloud, this one is incredibly light and does a wonderful job of blocking the bright Sun! It is a real mystery how Kolcraft has managed to pack so many features into a stroller that weighs just 11.8 pounds. 1) The Kolcraft Cloud Plus was born for traveling and day-trips. This stroller loves to be outdoors but also works quite well at the shopping mall. 2) The large three-tier extendable canopy keeps the Sun out and keeps the baby cool. It’s clever design and high quality fabrics provided maximum protection against ultraviolet rays. 3) Folds easily with one and stands on its own. No drama whatsoever! Also, this workhorse can accommodate up to 50 pounds, which is more than 4 times its own weight! Impressive. 4) The multi-position reclining seat with a 5 point safety harness keeps baby safe and comfortable at all times. 5) The stroller comes with a removable child tray with dual cup and juice box holder. This helps to make feeding easy. This is a really useful feature that’s often missing even on the top end models. 6) The Cloud Plus has some goodies for parents too. There’s a roomy storage basket for toys and other baby supplies plus a parent tray with two cup-holders and a small storage area. 7) One year manufacturer warranty protects the buyer against unexpected breakdowns and defects. 2) The wheels do not offer much tread. Overall, The Kolcraft Cloud Plus is great for vacations, for public transportation or simply for traveling light. You can just keep it in the car and use flip it open whenever required. Does not occupy much space and does everything that a good lightweight stroller should. Overall quality of construction could have been better but it’s in line with the pricing. 1 Year warranty tilts the balance in favor of this stroller. I hope you enjoyed reading about some of the best strollers for toddlers. Which one did you end up picking for your tiny tot? Please share your thoughts and opinions in the comments section below so that other parents may benefit from your insights.